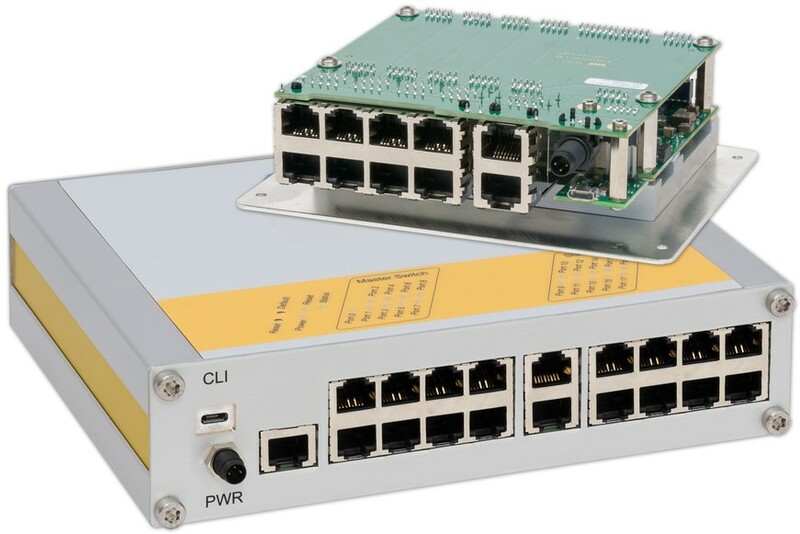 MPL expands their reliable Switch Family with a rugged 10-port and 19-port version. The new solution is designed according MPL's design philosophy which includes; long-term availability, extended temperature capability, flexibility, and low power requirements. The new µMAGBES is designed to be operated in a Master-Slave configuration, making a flexible system with cascaded switch easy. The new solution is available with 10 ports and 19 ports, including a Command Line Interface (CLI) option. All ports are executed with high quality RJ45 connectors to meet application needs in rugged industries and environments. All µMAGBES configurations are extremely compact and start with a size of 137mm x 108mm x 42mm. For integration in an existing cabinet or housing, the switch is also available in an open frame configuration with a mounting plate for easy integration. Hence it is the perfect solution to be customized and integrated in small places. All ports have status LEDs, showing the activity and speed of each port and are available on an external LED panel. The same applies for the reset switch and the default settings. The input power requirement of the µMAGBES is 5-36VDC and the device uses less than 6W at full speed with 10 ports operational. The switch can be operated in an environment of -20°C up to +60°C, and optionally -40°C to +85°C. The µMAGBES does not need to be cooled by a fan. These features plus all the additional functionalities make µMAGBES the ideal candidate for any robust, industrial and secure network application. Due to the low power consumption, robust and flexible design, the product is well suited for any embedded system and solution. In addition to the RJ45 configuration, the µMAGBES is also available with M12 connectors or as open frame solution with lockable headers, or can be integrated in a 19" rack enclosure. In addition MPL provides solutions with an IP67 MIL housing and MIL connectors of the customer choice. The µMAGBES (HW & SW) is 100% designed and manufactured by MPL AG in Switzerland. This guarantees best quality, long-term availability, and longtime repair service, and gives you security you can trust.